I Just moved to the South bay area in California and I am looking for some local Speedflyers to go fly the bay area skys. I fly an ITV Bip Bip 16m and I have been flying with the Flystyle team up in Portland, OR for the past year and a half. Look forward to hearing from some local flyers!!!! 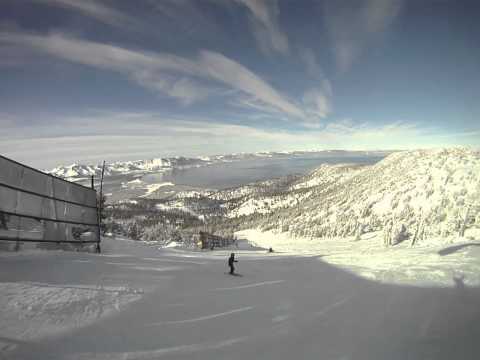 I'm headed up to mammoth this weekend, moved here form Hawaii not to long ago, been killing it out there. Wasn't to sure about flying at Mammoth but thought I'd bring my rig anyway. 14m Ozone bullet. Really glad to hear someones been flying up there, where's a good launch. I'll fly with anyone any day if I can make it. I came to chamonix for the mountains because in Spain there's nothing like this. But since I'm here I saw nobody doing speedflying but paragliding. ( Probably for the temporal banning ). I don't mind to go alone but if there is someone or a group and you want, we can meet and talk or fly. Man, where you guys been?!!! Have been speed flying all winter and spring in Cali, and have come across almost no one! Mostly in the Bishop/Mammoth area, but other spots as well. Sometimes I get a small crew of 3 to 5 speed pilots together for weekends in the Sierra and White Mountains, but most of the time it is just me. For sure i am psyched to meet up with other pilots in the area, drop me a line when you want to go fly. I get out and fly about four or five days per week with my XT-16, mostly foot launching lately since the snow is melting out. My email is elcapbum@yahoo.com Will be working for the summer in Yosemite, and will be making flying trips to Shasta, the Sierra, Bay area sites, and SoCal spots during the summer and fall. Mid September it will be on again, no work- just play. Hi, everyone I just moved to the South Bay and am also looking for speed fliers. I have several hundred PG flights, several dozen jumps, and a couple of ground launches with skydiving canopies. Currently trying to find a good first speed wing. I'm also a pretty decent skier, so if you're making any plans whether for the snow slopes or flying here then I would like to come. Anybody has experience with Pil Pit 16m? Ive always wanted to fly heavenly, there is some sweet footage around of someone flying gunbarrel a couple years ago, but I think Milky Way could be a good flight. As far as I know Mammoth doesn't currently allow speed riding. There's a Bartender at the Clocktower in Mammoth main village who is a P4 paraglider and has permission to launch off the back side, if you stop by and ask for him he might be able to get you on the hill. We have a few speed fliers and paragliders in a little town called Tehachapi on the south end of the Sierras. I'll be in Tahoe on March 10-14th and would love to try and speed ride while I'm there. Who is your contact at Hevenly? Will you be around then, maybe we can meet up? Like I've mentioned to a couple of the posters here, I'm organizing a trip to Mammoth Mountain for the end of the month or early February. Honestly, their anemometers have been clocking some pretty lame winds lately, but I'm gonna go for snowboarding regardless... The plan would also be to get some speed riding in if the conditions are favorable... I'd definitely like to meet up with other speed riders, so feel free to contact me if you think you'd be interested. I live in Coloma CA and ski at Kirkwood. I got one flight there last weekend before the patrollers caught me. They were really cool but would not let me take another flight. Kirkwood has two good sites just out of bounds where you can traverse back to the lifts with minimal effort. I am a good skier and have a paragliding background. I am just learning to speedfly and would be stoked to hook up with you guys. There is also a guy named Ed Youmans that flies around North Lake. West. Flying 1/13-17th. Rookie year just out of cld9 p2. Go to iFly Wind Tunnel in San Francisco and ask for Kris, make it before the end of Jan as he is relocating off the continent for the next year. He has be speed-flying since 2002, and currently is flying 12m ozone bullet. Where are all the spots for speed flying in California that don't require paragliding ratings? Cause were not paragliders!!!!!!!!!!!!!!!!!!!!!!!!!!!!!!!!!!!!!!!!!!!!!!!!! Hey I totally agree that we should get together for some flights. I'm going to Pacifica for some foot launches tomorrow if you would like to join. 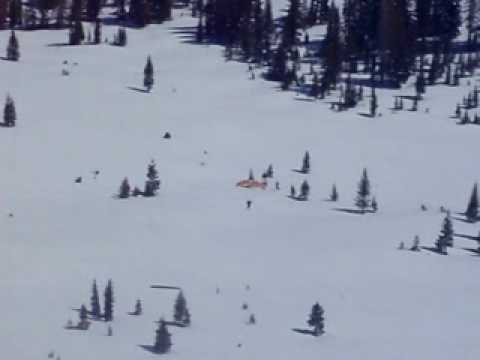 I also spoke to the events coordinator at Alpine Meadows, Tahoe and she has never heard of anyone speed flying and I told her that i would like to try to set up a speed flying boogie sometime and she said that she would look into it but I have yet to hear back from her. I have also been trying to fly some paragliding spots but have been getting denied flight cause I dont have a paragliding rating. I dont see what the big deal is but it's starting to get annoying. I fly an ITV Bip Bip 16m and I have had probaly 100 foot launches and no speed riding launches on skis but looking forward to purchasing some skis soon so that I may partake in that action. I have 12 Skydives under my belt but didn't keep up with it as much as I wanted cause speedflying just kinda took over. Here is my email add so we can exchange some contact info. Lets fly!!!! So, here's my first attempt at Speed Riding. Per my conversation with the director of the Heavenly Ski Patrol, I'm apparently the first person to try it at their resort, and possibly the first at any resort in Tahoe. The canopy I used was a Safire2 169 loaded at 1.3 and the container/harness was designed and built by myself. When I launched, the winds at the top of the run (10,040ft) were the best they had been in the last several days at about 15mph, but there was still the occasional gust at just under 25mph... A bit higher than I would have liked, but the direction was almost exactly in-line with the run and there was minimal turbulence, so I decided to go for it. Getting up on my board while controlling the canopy was pretty awkward, but being my first attempt, I think I did pretty well overall. It was a pretty short flight, but I hope to make more in the near future. This saturday I flew off the top of Heavenly Ski Resort (South Lake Tahoe, CA) and sucessfully flew a portion of Ellie's. Per the Heavenly ski patrol director, I'm the first to do speed riding at heavenly and possibly the first at any resort in Tahoe. I'll post the video in a day or so. I have about 200 skydives and 50 ground-launches on the same canopy that I used on Saturday (Safire2 168 loaded at about 1.3). I'd definitely like to meet up with someone else to partner with, as I'd like to begin making flights on a somewhat regular basis. Unfortunately, there seems to be fewer speed riders in California than even base jumpers (I know about a dozen base jumpers, but I've never met anyone who's even attempted speed riding). Additionally, I'd definitely like to coordinate with anyone who would like to help introduce speed riding to CA resorts. In speaking with the staff at Heavenly, it sounds as if their primary concern would be the safety of the other patrons at the resort. My proposal was that allowing speed riding on low traffic days (maybe just weekdays) and only on low traffic runs would provide a good starting point. Yep Johhny's a cool cat... We will totally vouch for him, he's pretty heads up and is getting to know that 16m speedwing very well! We had him on our 12m HellRacer quite a few times... We are hoping to send down some demos soon.